The backup data of the free version can be restored into the paid version, or vice versa. The old version's backup data can be restored into a newer version, but not vice versa. The restored documents may be added into the bookshelves with the original information but as a newly added one. If the same document already exists, you can distinguish them by the time added. The restored bookshelves will be unlocked even if those were locked before. Backup pdf-notes data by copying the DoNotEdit folder. (1) Connect iPad to iTunes and select <your iPad>. (2) Select Apps in the tab menu. (4) Select the DoNotEdit folder in the [pdf-notes Documents] section. The DoNotEdit folder contains two important data files and multiple document folders. Therefore, if the zip file size of the DoNotEdit folder is larger than 1.5GB, we need to prepare the pdf-notes backup data as two or more smaller sized zip files. 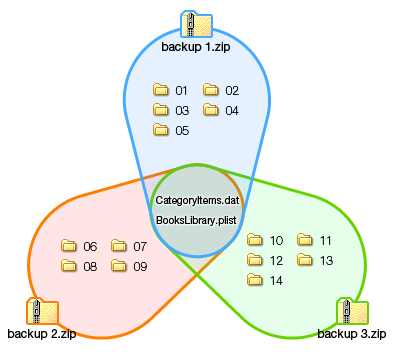 Every zip file of pdf-notes backup data must include CategoryItems.dat and BooksLibrary.plist files. Any zip file missing one of them is not a pdf-notes backup data. Compress the DoNotEdit folder to a single zip file. 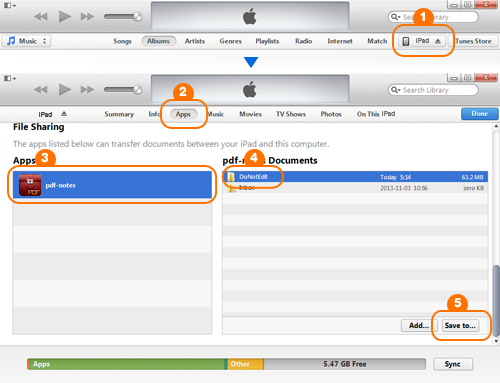 If the file size is smaller than 1.5GB, it can be restored into iPad. Or the file size is larger than 1.5GB, the backup data should be consist of multiple zip files. 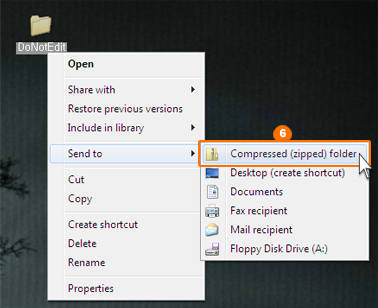 Each zip file can be created by compressing the selected multiple document folders. In every zip file, both CategoryItems.dat and BooksLibrary.plist must be included. Each zip file should be smaller than 1.5GB. 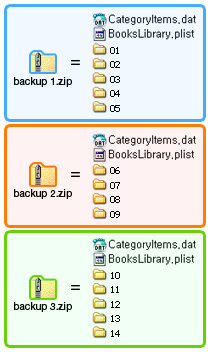 Each zip file should contain both CategoryItems.dat and BooksLibrary files. Each zip file should contain one or more document folders in the DoNotEdit folder. 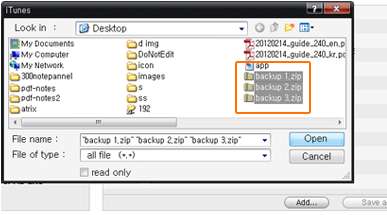 The multiple zip files of a backup data can be restored at the same time or one by one. If the multiple zip files of a backup data are restored at the same time, the order of books in the bookshelves will be restored. Otherwise, the order of books may not be kept. Add one or more zip files of a pdf-notes backup data onto [pdf-notes Documents]. 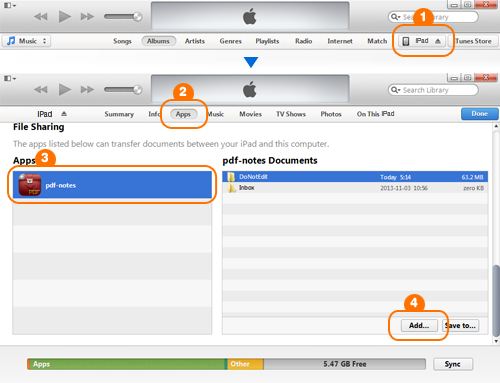 (4) Press [Add...] and add one or more zip files of a backup data into [pdf-notes Documents]. 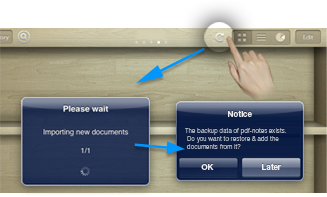 (5) Press the Refresh button after starting pdf-notes. Press OK to restore the backup data. Press Later to leave the backup data as an icon. You can press it anytime you want to restore it. So I have backed up my documents, so let's say I delete PDFs from a certain class, but keep the other ones on my iPad (backed up all of them)... If I go to restore them does it add another copy of everything else that was backed up that I never deleted? Yes, the restored documents will be located on top of their bookshelves. If I don't perform the back up will my documents be lost completely or is the back up just a precaution in case something goes wrong in the update? Please make sure that backup is not an option but a must. I've purchased pdf-notes. When I do a backup of a document from my pdf-notes-free and I open it in pdf-notes, the bookmarks index is empty. How can I open my documents from my free version with absolutely all kind of annotations? I have no i-tunes, I don't have nor Mac neither Windows. Thank you. I am sorry but you need iTunes to backup and restore pdf-notes data. 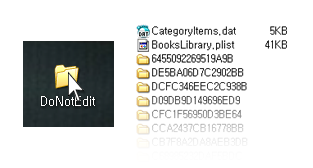 Divided DoNotEdit folder into 4 folders, each one containing a copy of Bookslibrary.plist and categoryitems.dat an series of folders so the file size is less than 1GB. They are named: backup 1, backup 2, backup 3 and backup 4. Selected pdfnotes in File sharing. Added DoNotEdit folder containing Bookslibrary.plist and categoryitems.dat. When I open pdf notes, it shows all book titles organized in categories but the content (books) is missing. P.S. I have now managed to not be able to see anything within pdf notes, not even the categories and lists of books. I have deleted the DoNotEdit folder and replaced it by a new one containing ONLY Bookslibrary.plist and categoryitems.dat and added the backup zip folders. When I ask to backup, it gives me the following error: invalid backup data, please refer to multiple zip backup section of manual. I think I am following the instructions but it is not working, can you tell me what I might be doing wrong or how to solve the issue? The version of pdfnotes can not be upgraded because I have an old iPad. Please check your email. You can update to the 3.6.27 version for iOS 9.